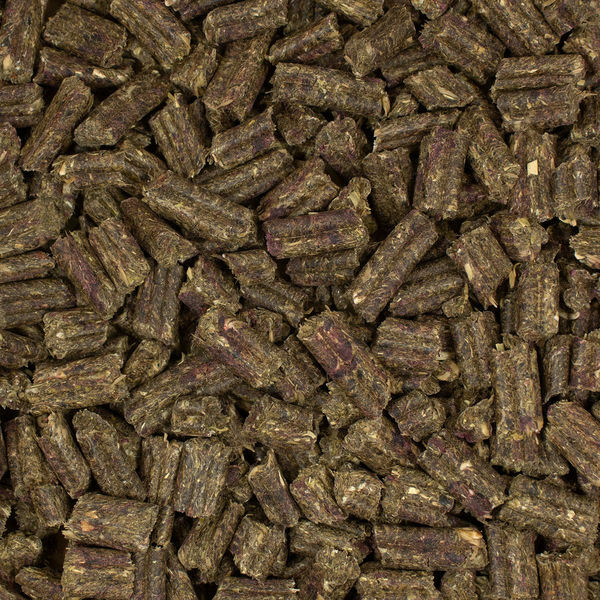 New complete, all-pellet diet designed to support guinea pig dental & overall health. 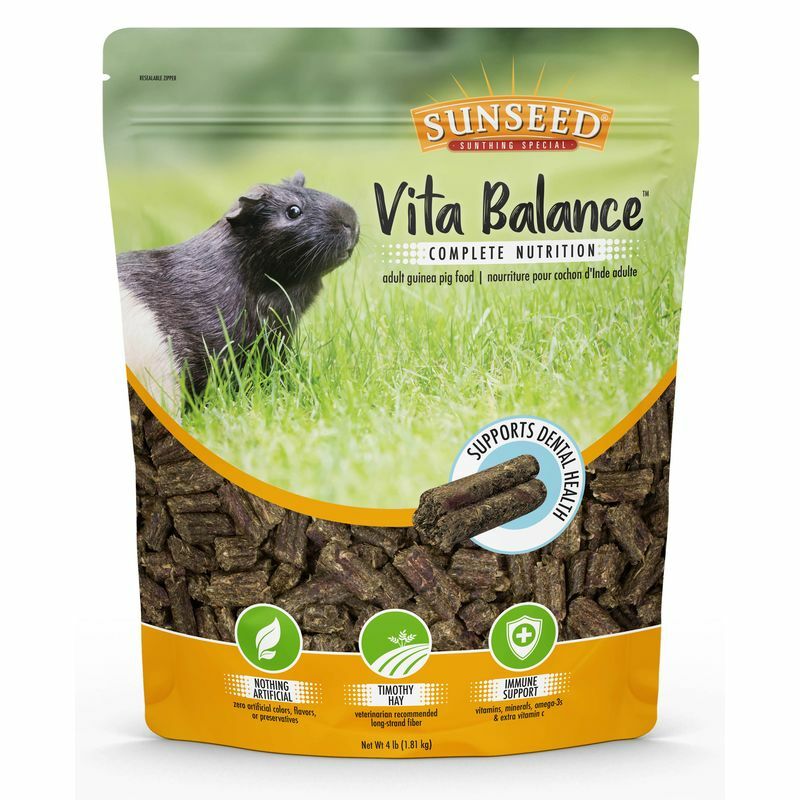 Crafted with the freshest hay, veggies, and herbs available, Vita Balance is complete diet for adult guinea pigs made without artificial colors, flavors, or preservatives. The unique pellet ridges & shape provide intensive chewing for better dental health, while the larger pellet size creates less waste (perfect for guinea pigs that like to tip their bowls over!). 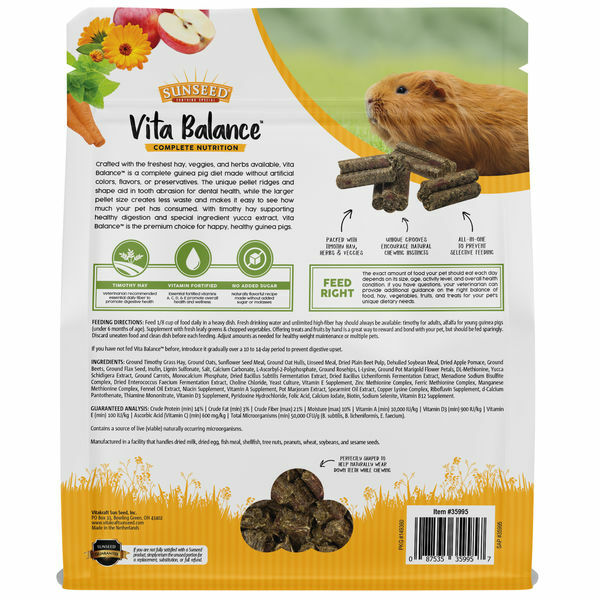 With #1 ingredient timothy hay promoting healthy digestion and yucca extract working to reduce odors, Vita Balance is the premium choice for happy, healthy guinea pigs. Refer to the chart printed on the bag for suggested daily amount of Vita Balance to feed based on your guinea pig's age: (0-6 months - up 1/8 cup or as needed | 6 months & older - 1/8 cup). Guinea pigs should always have access to fresh clean water and be given plenty of high-fiber hay daily (timothy for adults, and alfalfa for young, pregnant, or nursing guinea pigs). When switching diets. start by mixing a little Vita Balance in with their current food. Over 2-3 weeks, gradually increase the ratio of Vita Balance every day, until you are filling their bowl with only Vita Balance. Ground Timothy Grass Hay, Ground Oats, Sunflower Seed Meal, Ground Oat Hulls, Linseed Meal, Dried Plain Beet Pulp, Dehulled Soybean Meal, Dried Apple Pomace, Ground Beets, Ground Flax Seed, Inulin, Lignin Sulfonate, Salt, Calcium Carbonate, L-Ascorbyl-2-Polyphosphate, Ground Rosehips, Ground Pot Marigold Flower Petals, L-Lysine, DL-Methionine, Yucca Schidigera Extract, Monocalcium Phosphate, Dried Bacillus Subtilis Fermentation Extract, Dried Bacillus Licheniformis Fermentation Extract, Menadione Sodium Bisulfite Complex, Dried Enterococcus Faecium Fermentation Extract, Choline Chloride, Yeast Culture, Vitamin E Supplement, Zinc Methionine Complex, Ferric Methionine Complex, Manganese Methionine Complex, Fennel Oil Extract, Niacin Supplement, Vitamin A Supplement, Pot Marjoram Extract, Spearmint Oil Extract, Copper Lysine Complex, Riboflavin Supplement, d-Calcium Pantothenate, Thiamine Mononitrate, Vitamin D3 Supplement, Pyridoxine Hydrochloride, Folic Acid, Calcium Iodate, Biotin, Sodium Selenite, Vitamin B12 Supplement. 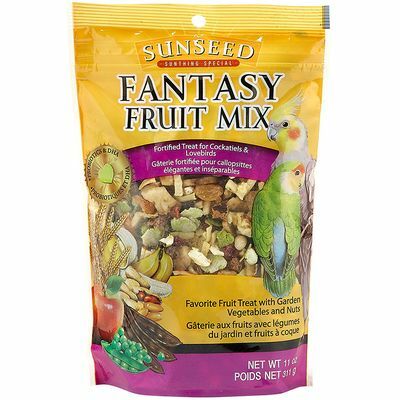 Delicious mixed fruit treat for cockatiels and lovebirds blended with nuts and tasty garden vegetables. 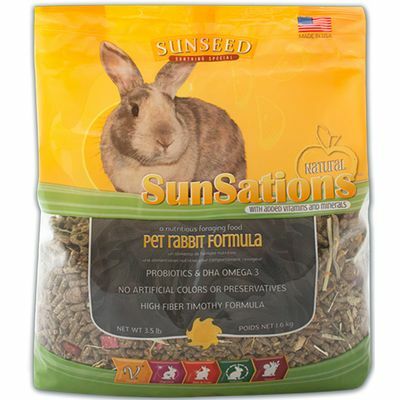 A natural timothy hay-based diet fortified with key nutrients to help keep your pet rabbit happy, healthy, and playful.